Portree Lifeboat was called into action for the first time in 2019 and it was the first shout for the newly-appointed duty mechanic. At 12.50pm on Saturday January 5, the Portree RNLI Lifeboat was launched to help a local fishing boat with engine issues on Loch Snizort. The three fishermen on board were safe and well but the vessel needed a tow back into Uig, Skye. 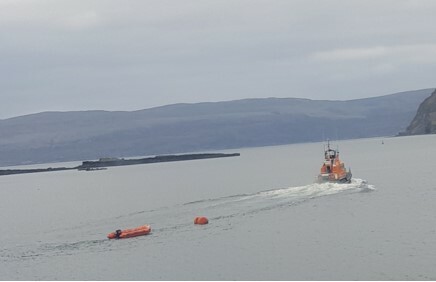 The lifeboat arrived on site at 2.20pm and established an alongside tow, arriving at Uig at 2.45pm, departing at 2.55pm for Portree after making the vessel secure. On board was duty mechanic Stuart ‘Stupod’ Nicolson on his first shout as the mechanic. Stuart started with the crew at the age of 17, joining his father John Nicolson, the full-time mechanic. John was on annual leave the day of 2019’s first shout.